If you find the room type that you are interested in is showing as not available online, please call us at (800) 433-9731. Our associates may be able to assist you! 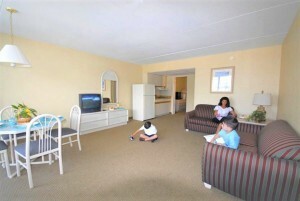 Direct Ocean Front Efficiency with Private Balcony, two double beds, flat screen television, table with four chairs. Kitchen with apartment sized refrigerator / freezer, basic cookware, flatware, dinnerware, two burner electric cooktop, microwave, coffee maker, toaster. 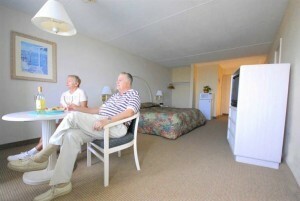 Direct Ocean Front VIP Motel Room with private balcony, king bed, flat screen television, beverage refrigerator, microwave, table with two chairs. 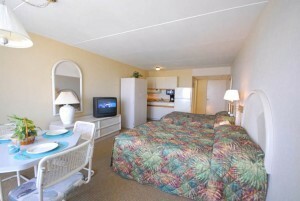 The room includes a connecting door to an adjacent Type “A” Ocean Front Two Room Efficiency Suite. Pool & Ocean View Two Room Efficiency Suite includes living room with double sleeper sofa, flat screen television, table with four chairs. Kitchen with apartment sized refrigerator / freezer, basic cookware, flatware, dinnerware, two burner electric cooktop, microwave, coffee maker, toaster. 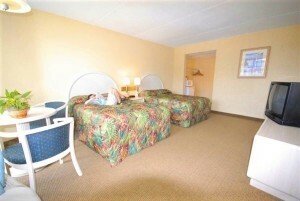 Bedroom includes two double beds, flat screen television. Pool & Ocean View Extra Large Two Room Efficiency Suite includes living room with double sleeper sofa, flat screen television, table with four chairs. Kitchen with apartment sized refrigerator / freezer, basic cookware, flatware, dinnerware, two burner electric cooktop, microwave, coffee maker, toaster. Bedroom includes two double beds, flat screen television. Pool & Ocean View suite includes living room with double sleeper sofa, flat screen television, beverage refrigerator, microwave, table with four chairs. 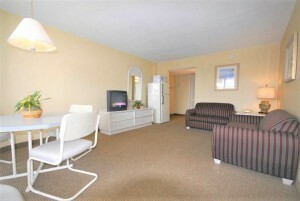 Bedroom with two double beds and flat screen television. 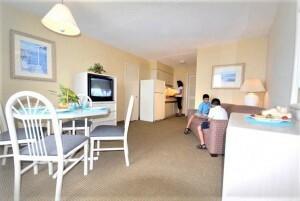 Ocean & Pool View, Two double beds, flat screen television, beverage refrigerator, microwave oven, table with two chairs. Ocean & Pool View Efficiency, one king bed, flat screen television, beverage refrigerator, microwave oven, table with two chairs.